Driving long-term business growth for a fellow Certified B Corp. There are many reasons to work with Mightybytes, not the least of which is their commitment to excellence and professional approach. Their team delivered on every requirement we made and we are thrilled with what they have created for Dharma. Here’s how Mightybytes helps a fellow B Corp increase qualified leads, improve their website, and drive year-over-year sales. Dharma Merchant Services is a Certified B Corporation, committed to the practices of compassion, sustainability, and transparency in credit card processing. The company’s content-heavy website wasn’t effectively communicating these practices nor did it serve as an effective or impactful sales tool. In late 2013, Dharma contracted Mightybytes for a complete website redesign. We have been helping them improve its role as a valuable business tool ever since. Screenshots of various web forms on the Dharma website. For the redesign, designers and content strategists worked together to create wireframes that balanced text with design elements, telling a visual story about Dharma’s unique values in the marketplace rather than relying on written content to communicate them. In early discovery workshops, we learned that many new customers apply online, so we spent a lot of time designing signup pages that were friendly and inviting while still optimized to convert visitors to customers. Almost every high fidelity wireframe starts as a sketch. 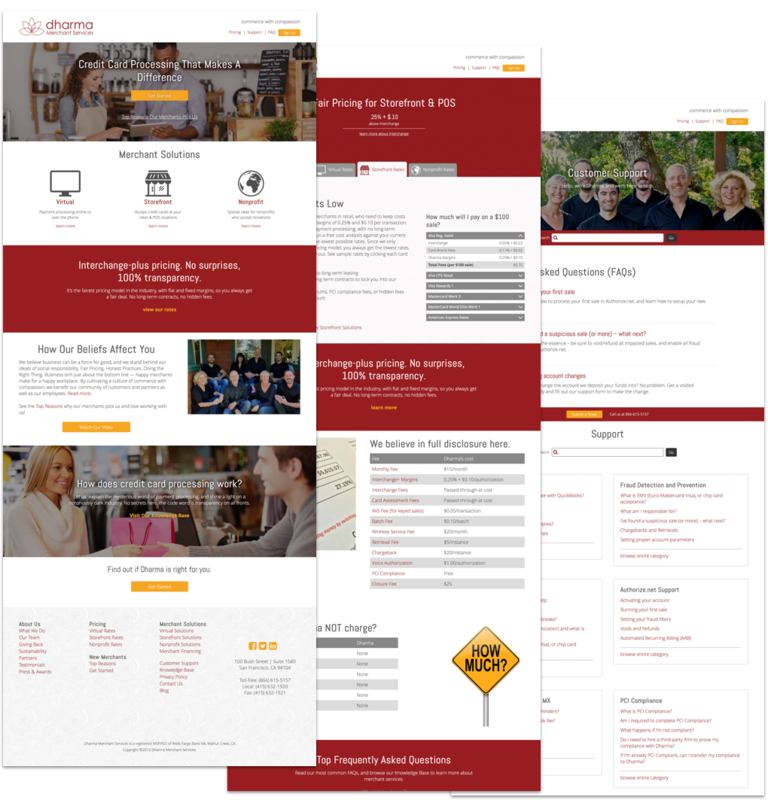 To ease the difficulty of editing content while simultaneously migrating it to a new design, we wrote optimized copy and created design elements for ten of Dharma’s most important site pages. These served as templates for the Dharma team to use when migrating content. During this process, we worked with them to pare down content, select new images, and write important button and form copy that would increase conversion rates. Our developers and designers worked with Dharma’s existing third-party software, FormAssembly, to create a step-by-step online application process that filtered out unqualified applicants while gathering important upfront information from qualified leads. The team now has less processing to do on the back end and more mission-aligned clients lining up to do business with them. Facilitating a remote conversion rate optimization (CRO) workshop with the Dharma team. During this time, we also facilitated workshops to map and improve their sales funnel and improve conversion rates on key forms and landing pages. Shortly after launching the new site, Dharma saw a 131% improvement in traffic coming from organic search and increased conversions from referral traffic. Since then, we have worked with Dharma to incorporate data-informed decision making into their monthly digital marketing efforts. The SEO efforts alone have generated significant improvements with several landing pages featured on page one of search engine results. Some of these pages have seen as much as a 30% increase in organic traffic and improved conversions as well. Because of these ongoing efforts, Dharma’s website continues to generate hundreds of customer leads every month. Page designs and an improved user experience tell Dharma’s story in a visually compelling manner.